Mont Marte Satin Acrylics are available in 31 beautiful colours featuring premium quality pigments with a smooth, medium viscosity. 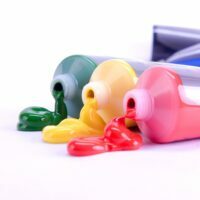 Completely mixable and highly versatile, Satin Acrylic can be used directly from the tube or diluted with up to 20% water or acrylic medium while still holding strong colour intensity. Drying quickly to a flexible semi-matte finish, Satin Acrylics will not crack or become brittle over time. At the end of a painting session, simply wash up with water. 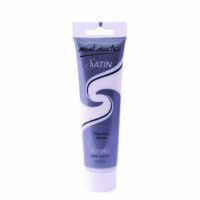 Mont Marte Satin Acrylic paints have been tested for lightfastness to the British Blue Wool standard, with test results indicating a Level 6 (equivalent to an ASTM II) and above rating for every colour in the range. Under conditions of museum exposure Satin Acrylic pigments will remain unchanged for 50-100 years. 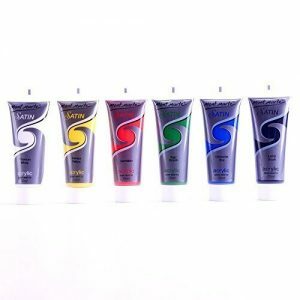 Each Satin Acrylic paint tube includes Colour Index (CI) pigment codes, and a star and moon rating to provide guidance on lightfastness and opacity. MontMarte Akríl Satin 100 ml – Titanium White – 31 Litir á lager 350 kr.